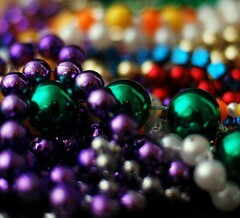 Hello foodie friends and Happy Fat Tuesday! We’ve had our fill of Paczki‘s (pronounced poonchkis)! What is a Paczki’s you ask?!?! A delicious Polish inspired donut-type treat that is either jelly or cream filled, they are extremely popular tradition in the Chicagoland area. My kids have really come to look forward to this tradition and came home from school searching for the Paczki’s! For the past few years I’ve been making Jambalaya for dinner on Fat Tuesday in honor of the Mardi Gras festivities. Tonight I hit the jackpot with a recipe we all really enjoyed! Even Allison, who eats little meat, was able to pick around the sausage and enjoyed the dinner. I was able to make the recipe a little healthier with a few modifications. I hope you enjoy as much as we did! In a bowl, toss the shrimp and chicken with the creole seasoning. In a large saute pan, sprayed with olive oil spray, saute the peppers, celery,and onions. Saute about 3-4 minutes or until tender. Add garlic, drained tomatoes, bay leaves, Worcestershire and hot sauce. Stir in raw rice and slowly add the chicken broth. Reduce heat to medium and cook with a lid until the rice absorbs the liquid, stirring occasionally for about 15-20 minutes. Add the meat (chicken, shrimp, and sausage) and stir. Cook until the meat is cooked through (if you have used meats that are already cooked as I did, this wont take long) If desired, season with addition creole seasoning depending on your “heat” tolerance. Posted in Dinner, Mardi Gras and tagged Bay leaf, Broth, Cook, Jambalaya, Mardi Gras, Pączki, Sausage, Worcestershire sauce. Bookmark the permalink. Thank you for the compliment. The blog is actually just a template from wordpress….and most likey a free one! Best of luck!